WIKA’s All-Welded Systems Meet EPA’s Dual Containment Requirements WIKA’s All-Welded System (AWS) was designed in partnership with one of the world’s largest chemical companies to protect against fugitive emissions. With AWS, WIKA welds a diaphragm seal and a pressure gauge together to produce a completely sealed pressure-measurement system. AWS gauges have no threaded connections, which prevents leaks through threads and provides high tamper resistance. Tough AWS pressure gauges can be used in almost any process environment. 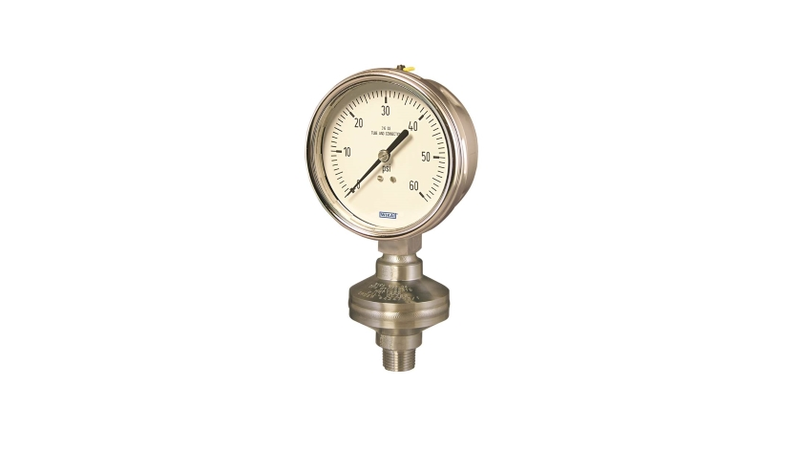 These versatile process gauges are certified to operate in pressure applications from 10” Hg to 20,000 psi and at media temperatures between -130°F and 752°F. A cooling element can be added between the pressure instrument and diaphragm seal for added protection in extremely high-temperature processes. Remote seal solution for dual containment All-Welded Systems have been designed for easy installation and to meet 21st century design-safety requirements. All AWS products meet the EPA’s stringent “Dual Containment Requirements” to further minimize the chance of leakage. Greater safety in extreme processing environments Safety is a major concern in the manufacturing and refining industries, and All-Welded System instruments are built with the safety demands of the process industry in mind. AWS products are designed to function in extreme process environments including harsh temperatures, variable pressure ranges, pulsation, vibration, aggressive chemicals, and steam. These tough diaphragm seal systems are ideal for high-vibration, thermal-cycling, and pump-discharge applications. Reduced fugitive emissions WIKA’s All-Welded System is suitable for applications where emissions to the environment are tightly monitored. A small amount of fugitive emissions is almost unavoidable in process facilities, as some of the volatile liquids and gases used or produced in manufacturing and refining inevitably escape through micro leaks at connection points. You can, however, dramatically minimize fugitive emissions at your plant by using AWS pressure gauges.